Rotary Youth Leadership Awards (RYLA) is a leadership training programme for teenagers. Each year, the Rotary Club of Cranleigh seeks two candidates for sponsorship on the week-long course. In 2014, the lucky people to attend High Ashurst Outdoor Activity Centre at Box Hill, near Dorking, were Georgina Ferrier and Taiga Kobayashi from Glebelands School. During a presentation to the Club after the event, they explained the value of the course, with its opportunities to meet other students from many different places, to bond with them and to gain team-building skills. With no access to TV, radio or newspapers, the emphasis was on outdoor activities, including exercises such as raft building, abseiling, kayaking, building and sleeping overnight in tepees, and a lengthy hike with navigation clues along the way. However, everyone was given a treat by attending a performance of "I Can't Sing!" in the West End, and the week ended on another high with a concert put together by all the RYLA attendees. Both Georgina and Taiga agreed that they had learned many new skills throughout the week and made lots of new friends. "I wish it had been longer!" said Georgina. 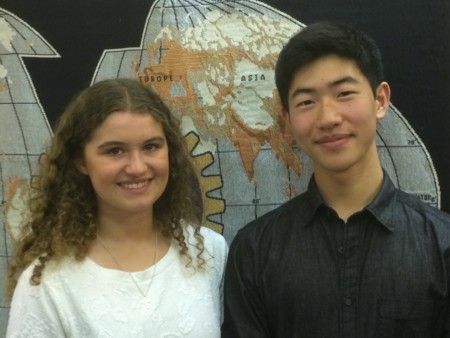 Image caption: Georgina Ferrier and Taiga Kobayashi, who were sponsored by the Cranleigh Rotary Club for the 2014 RYLA course.